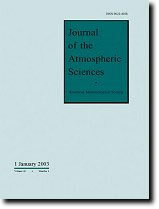 Goddard Institute for Space Studies, NASA, New York, N.Y.
Journal of the Atmospheric Sciences, volume 21, pages 152–156. Radiation data obtained from TIROS III has been analyzed, separately for day and for night, for the period July through September 1961. The global distribution of the average effective temperatures measured by the 8–12 μ channel of the satellite radiometer shows a close correlation with the cloud cover data. An estimate of the latitudinal distribution of cloud heights has been obtained using the TIROS radiation data for daytime and the distribution of cloud cover recently obtained from the TIROS photographs. Combining these values of the cloud heights with the nighttime radiation data determines the latitudinal distribution of nighttime cloud cover. The results indicate that in the Southern Hemisphere the percentage cloudiness at night is considerably higher than in the day, while in the case of the Northern Hemisphere the cloudiness appears to decrease at night.